My Furnace wont Shut Off — What Now? If your furnace wont shut off and you’re worried, don’t panic. The first thing to do is check the thermostat. Check whether your fan is set to On or Auto. If it’s On, try setting it to Auto — this will turn the fan off when the temperature reaches the desired setting. If your thermostat is set extremely high, your furnace might not be able to keep up. A set temperature above 80 degrees strains almost any furnace, especially in a big house or in cold weather. Finally, look at whether your home’s temperature is above or below your set temperature. If it’s below, it means your furnace is working too hard and may have a clogged air filter. If it’s above, it means something might be more seriously wrong and it’s time to call Aspire. When your furnace turns on, its return ducts start pulling in air from your house to heat. Return ducts pass air through the filter, which removes dust, dirt, and other particles. A clogged filter prevents your furnace from getting the air supply it needs. It tries to make up for this by working overtime — but as the filter gets dirtier, this becomes less effective. This article offers some helpful tips on changing your filter. (Different types of furnaces have their filters in different places.) You should check or change your air filter every three months at least. Change your filter and wait an hour to see how your furnace reacts. If the problem persists, it’s time to make the call. If you’ve followed the first two steps but your furnace still won’t shut off – it’s time to call Aspire. It could be a faulty blower motor switch, leaky ductwork, or a wiring problem on your thermostat. You’ll want a qualified professional to take care of these problems. Aspire is the Winston-Salem and Clemmons area’s premier HVAC company. Founded, owned and operated by local veterans, Aspire understands what it means to serve country and community. We’re NATE-certified and qualified to handle a wide range of heating issues, including furnaces and thermostats. If you’re an existing customer or have a maintenance plan with us, we even offer after-hours service! 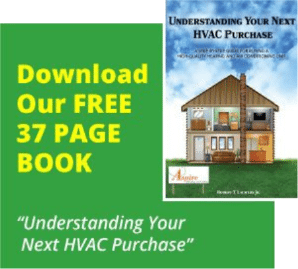 Aspire stands ready to help with all of your HVAC needs. Call us at 336-750-6895 or use our contact form.